Pamplin Media Group - OVER THE HUMP? Happiness for the Trail Blazers is winning a playoff game, no matter the circumstances. 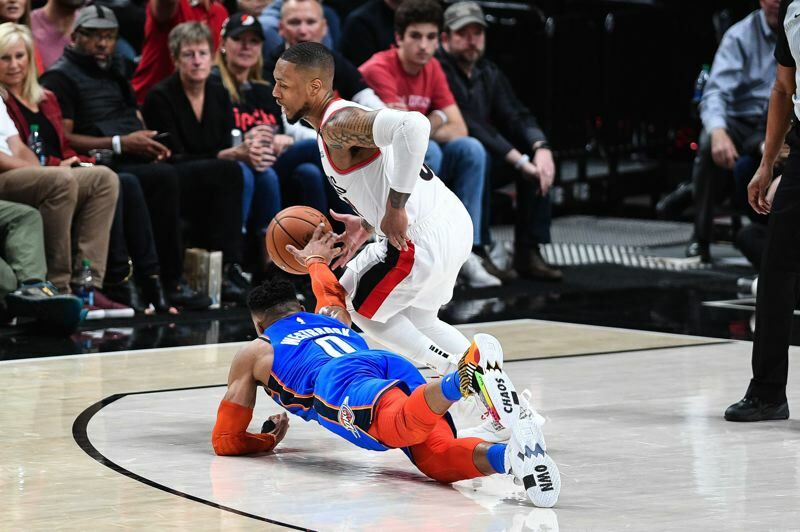 Portland's 104-99 victory over Oklahoma City at Moda Center in Sunday's opener of the first-round playoff series wasn't suitable for framing. The Blazers shot .419 from the field, committed 19 turnovers and nearly let a 19-point first-half lead slip away. In the end, though, the Jumbotron flashed the big "W!," the Moda throng thundered its approval, and that was so much better than the alternative. "It's a great feeling," point guard Damian Lillard said after the Blazers' snapped a 10-game postseason losing streak dating to 2016, including the ignominious sweep by New Orleans a year ago. "We've gone two playoffs without winning a game, so it's good to get back on the winning side." As is always the case in a seven-game series, though, it won't mean much if the Blazers fall in Tuesday's 7:30 p.m. Game 2. 'Our goal isn't to win one game," Portland shooting guard CJ McCollum said. "We want to take advantage of the home court. Last year is over with. We learned from it. Now we know what it takes to get over the hump." That remains to be seen. What is certain is the Blazers came out ready to go Sunday, staggering the Thunder with a 39-point first-quarter haymaker that turned into a 47-28 lead early in the second quarter. "We came into the series knowing we had to be the team that delivered the first blow," said Lillard, who scored a game-high 30 points to go with four rebounds, four assists and three steals. "We had to come out aggressive and make a stand. Whether it's a win or a loss, we made it a point where we're going to come out aggressive — just have the attitude that we're going to be here all (afternoon)." The Thunder, meanwhile, were off to what charitably can be characterized as a shaky start. Small forward Paul George, who averaged 38.0 points, 10.5 rebounds, 5.5 assists and 2.8 steals as OKC swept its four-game regular-season series with Portland, was a game-time decision due to a sore right shoulder. George played 43 minutes and contributed 26 points and 10 rebounds, but made only 8 of 24 shots from the field, including 4 of 15 from 3-point range. OKC made only 5 of 33 shots (.152) from beyond the arc, the worst percentage of any Portland opponent this season. "We just didn't shoot the ball particularly well from the 3-point line," OKC coach Billy Donovan said in the greatest understatement since General Custer told his comrades at Little Big Horn, "fellas, we could be in a little trouble here." The Thunder, 2 for 23 from long range at one point, never stopped burping them up, but they kept missing. That wasn't due to any great defense on the Blazers' part. "I don't think it was anything we did," Lillard said. "It's one of the things we need to do a better job of (Tuesday). A lot of times it was Paul George. He shot about half of them, and he's the last guy we want shooting those shots. Some of the ones were open, and he just happened to miss them. "We have to tighten up and try not to allow that, but we love it when they miss them." Even with all the lousy shooting — the Thunder finished .398 from the field — they still made a serious run at the Blazers, drawing to within 93-92 with 2:44 remaining. The Blazers answered with just enough baskets — and four straight free throws by Lillard over the final 5.5 seconds — to pull out the win. "The way we closed it out was good for us," Portland coach Terry Stotts said. McCollum chipped in 24 points, albeit on 9-for-24 shooting, but it was center Enes Kanter who made the biggest difference for the Blazers. Waging a war in the paint against OKC strong man Steven Adams, Kanter — Adams' teammate and close friend during their 2 1/2 seasons together with the Thunder — scored 20 points and grabbed a playoff career-high 18 rebounds. Kanter collared a pair of huge offensive boards in the final two minutes and had the basket of the game — a left-hander off the glass with the shot clock about to expire to give the Blazers a 100-94 lead with 11.4 ticks left. "I don't know if we anticipated the left-handed scoop shot," Stotts quipped, "but that came in handy." Said Lillard: "He was the MVP of the game, especially down the stretch, getting us second, third opportunities. He had a huge presence, played a big part in us winning the game." Added McCollum: "He brought a little extra against his old team." Adams muscled in for several early baskets against Kanter, but the Thunder seemed to go away from that strategy as the game wore on. After all, things were going so well from 3-point territory. Kanter admitted it "felt awkward" to be going against his old teammates, especially Adams, a close friend and mentor of sorts. "I've played against them with the Knicks and the Blazers (in the regular season), but playing against them in a big game, it felt a little weird," Kanter said. "I was very nervous before the game. I tried to focus on Steven, and he wouldn't even look at me. I knew he was going to do that. But my teammates made me very comfortable out there." OKC guard Russell Westbrook had his usual triple-double — 24 points on 8-for-17 shooting, 10 rebounds, 10 assists in 38 minutes — but missed all four 3-point attempts and was reluctant to put up any shot from beyond 10 feet. Lillard wasn't perfect, either, with six turnovers and some questionable decision-making in the middle two periods. He was big in the clutch, though, scoring 14 points, knocking down two big 3-pointers and going 6 for 6 at the charity stripe in the final period. The Blazers now get the chance to again hold serve and take a 2-0 series lead back to Oklahoma City for Game 3. "We won only one game," Kanter said. "We can't be too happy. We have to go out there in the second game with the same mindset, play tougher and more physical." But claiming victory in a playoff game was meaningful for the Blazers, who hadn't done it in a while. "Last year, we didn't win a (playoff) game," Lillard said. "We know how it feels to win again. Now we can move on from that and stay focused on this series."